Engineer Matshela Koko's tweet - "@SundayTimesZA has since reduced the whole testimony of #AngeloAgrizzi and made it about @PresJGZuma . So much about objective reporting. " @SundayTimesZA has since reduced the whole testimony of #AngeloAgrizzi and made it about @PresJGZuma . So much about objective reporting. The "lackadaisical " media is trying too hard to deflect the nation's attention from Ramaphosa #Bosasa corruption. Ntja e tsokela ea e fepang! @SundayTimesZA is owned by @CyrilRamaphosa's owners! And nothing said about their fav CR's son? 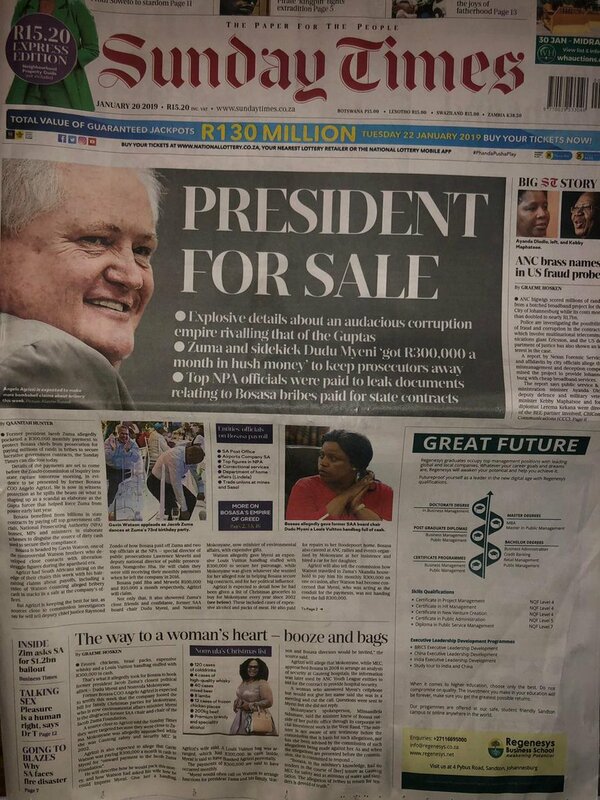 The Chairperson of the @StateCaptureCom must address this first thing on Monday and deal with this newspaper. What it has done will discourage other witnesses from coming forward to assist the Commission and SA. These people have no shame, this paper is a tabloid a tool of the devil.